High-quality makeup base that has amazing covering power to smooth out open pores. Clear type that isn't noticeable but still blends well to hide the pores. It's almost like invisible putty. 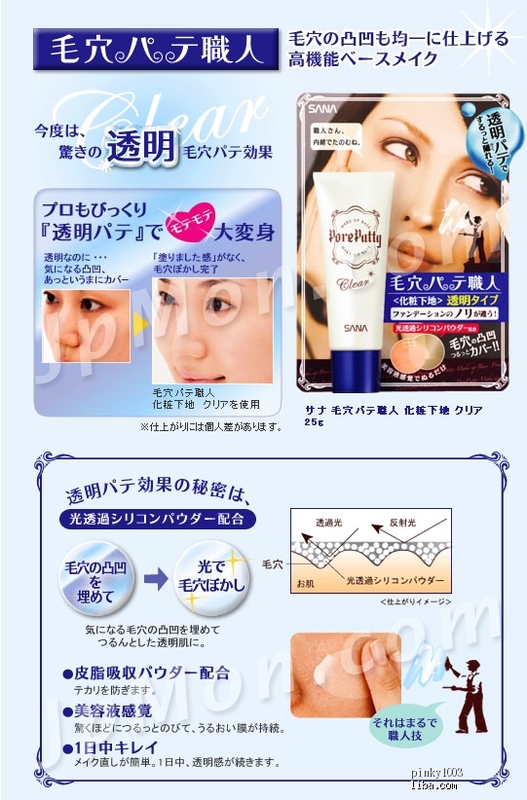 It glides easily across your face to create a shield to keep the moisture in. Mixture of oil-absorbing powder keeps your face free from oily shine and leave our skin smooth with a matte finish. It has moisturizing power that's almost like a serum treatment. After preparing skin with lotion and toner, take an amount approx. 2cm in diameter and spread over entire face. When finished, apply foundation. Cyclomethicone, Dimethicone, Vinyl Dimethicone/ Methicone Silsesquioxane Crosspolymer, Dimethicone / Vinyl Dimethicone Crosspolymer, HDI/ Trimethylol Hexyllactone Crosspolymer, Others.